Game 4 Notebook: Anybody see Holmstrom? 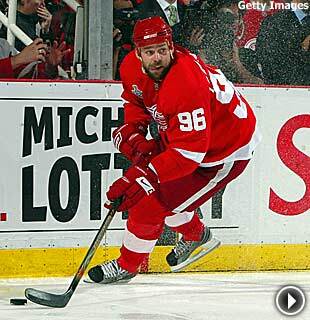 Tomas Holmstrom was still too stiff and sore from an injury he suffered in the final minutes of Game 3 to suit up for the Detroit Red Wings in Game 4 of the Stanley Cup Final. PITTSBURGH -- Tomas Holmstrom did not crack the lineup for Game 4 due to the hamstring injury he suffered in the closing minutes of Game 3. He was replaced by veteran forward Darren McCarty. Detroit coach Mike Babcock was asked when the team knew when Holmstrom would not be able to play. "When he didn't come to the game tonight," Babcock cracked. "I said to the trainers, 'Where is Tommy?' That's when I knew. Obviously, he was stiffer and sorer than we thought this morning." The Wings are hopeful Holmstrom will be able to return on Monday night for Game 5 in Detroit. History in the making – Should the Red Wings win this series, Nicklas Lidstrom will become the first European to captain a team to a Stanley Cup championship. While the Swedish defenseman is trying not to think about what surely would be a joyous moment, it is a statistic that is hard to ignore. "I try not to think about it," Lidstrom said. "It's been brought up a lot from the media. But I tried not to think about that. I'm trying to think more about having a chance to win another Cup. It's something that I try to push back and not think too much about." Hossa shines – Too bad Marian Hossa's performance Saturday came in a losing effort, because it just seems like a waste now. But Hossa was clearly the Penguins' best forward in Game 4 after feeling some heat for his lack of scoring in Games 1-3. Hossa scored the Penguins' lone goal, a beautiful tuck-in from the right side after it appeared he was going to bring the puck behind the net just 2:51 into the game. He had three shots on goal, but threw eight pucks at the net and had three blocked and two miss. Hossa put a puck off the crossbar less than two minutes after his goal. He also backchecked hard and created other even-strength scoring chances for linemates Sidney Crosby and Pascal Dupuis. "It doesn't matter, we lost the game," Hossa said. "I just look at the overall result and we didn't win. That's kind of disappointing." Everyone contributed – While he played less than six minutes on the night, McCarty received praise from Babcock for the leadership the gritty forward provided from the bench, particularly when the Wings were forced to kill off a two-man advantage in the third period. "I thought we really competed hard on the 5-on-3, and we have a veteran team," Babcock said. "Even McCarty did a great job on the bench. You've got to give him a lot of the credit. With six minutes left, he's standing up telling everybody go after them and don't back up. I think when you have veterans like that, it helps you get through situations like that." Still got it – It almost seemed like a slip of the tongue when Penguins forward Maxime Talbot said of the return trip to Detroit, "We're going to go with way more momentum then we did with Game 1." What's that again? Didn't the Penguins just lose Game 4? Don't they trail this series three games to one? Aren't their backs squarely against the wall right now? Talbot won't say no to any of that, but he also thinks that since the Penguins were maybe a bounce or a break away from winning Game 4 they should still have some semblance of momentum to carry into Joe Louis Arena with them. Grasping at straws? Maybe, but you can't deny this team's confidence. "I don't think we played a bad game. I don't think we got dominated tonight," Talbot said. "We played solid hockey and got a lot of scoring chances. We'll take the lead in next game, win the next game and come back here. That's the plan. I trust these guys. We know we can do it. We're going to do it." Where'd everybody go? 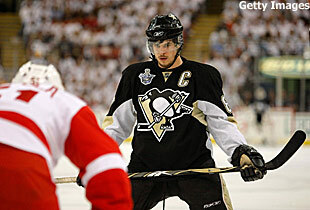 – The Penguins have scored only four goals in this series and three have come from top-line players Crosby and Hossa. Adam Hall remains the only Penguin from their other three lines to score, which is an obvious problem considering where the Red Wings are getting their goals from. Only two of Detroit's 12 goals in this series have come from their top-line guys. Fourth-liner Jiri Hudler scored the game-winner Saturday night. Second-liner Mikael Samuelsson scored twice, including the game-winner, in Game 1. Defensemen Brad Stuart and Lidstrom also have goals in this series. "All our guys are working hard, it's just a matter of the way the bounces are coming sometimes," Hall said. "I know there have been a lot of chances, a lot of rebounds laying around. It's a game of inches. The chances are there. We're on the doorstep hitting posts and crossbars. Rebounds are going across the line so when they're not going in it's very easy to get frustrated sometimes. We're close, we're that close. A few bounces here and there is the difference for us." Now the test for the Penguins is to keep believing in the "we're close" mantra. "That's the trick," Hall said. "It's not easy to kind of come back and keep that mindset, but that's what we need to do to be successful." Streaks snapped – Two significant Pittsburgh streaks were snapped Saturday night in the 2-1 loss. Goalie Marc-Andre Fleury's home-winning streak ended at 21 games as he lost his first game at Mellon Arena since Nov. 21. And the Penguins' regulation home winning streak ended at 17 games. The last time they lost here in regulation was Feb. 13. 'Sid the Kid' had a strong night in the faceoff circle, helping Pittsburgh win 32 of 54 of their faceoffs marking the first time this series that the Pens have won more than 50 percent of the draws. Quick draw – One reason for Detroit's ability to control the puck has been its dominance on draws. But with Crosby leading the way, the Penguins enjoyed a rare night of success in the faceoff circle. Pittsburgh won 32 of 54 faceoffs, the first time this series that the Penguins have won more than 50 percent of the draws. Crosby, who's evolved into one of the NHL's better faceoff men, led the way with 15 wins in 24 chances. Detroit's Kris Draper, who entered the game with a 63.4 winning percentage in the Playoffs, tops in the League, won just six of 13 (46.2 percent). It was the first time in 11 games that the Wings have had a losing percentage on faceoffs. It's happened just three times in the playoffs – and Detroit has won two of those games. Get your Tomas Holmstrom Red Wings name & number tee now! A hand for Holmstrom – The announcing of the scratches before the game usually goes unnoticed by fans as they settle in for the game. But not on Saturday. Mellon Arena erupted when it was announced that Holmstrom would be a scratch due to a hamstring injury. He didn't take part in the pregame skate. Holmstrom, who wears No. 96, was the last scratch announced. Pittsburgh fans applauded wildly at the news that the Swedish forward wouldn't be in the lineup. He was replaced by McCarty. Wings keep shooting – For the fourth game in a row, the Red Wings had more shots on goal than the Penguins. But the 30-23 margin doesn't demonstrate Detroit's dominance nearly as well as shots at goal does. The Wings took 65 shots at Fleury while the Penguins had just 42 at Osgood. It's a pattern that's been steady all through the series. The Wings have had 134 shots on goal in the four games to just 88 for the Pens; but they've taken 278 shots at Fleury (69.5 per game) to Pittsburgh's 178 (44.5 per game) – an average of 25 extra attempts per night. And, as any hockey fan knows, no team can score on your goaltender when you're shooting on theirs.